The 22nd edition of the Istanbul Theatre Festival, organised by the Istanbul Foundation for Culture and Arts (İKSV) and sponsored by Koç Holding Energy Group Companies Aygaz, Opet and Tüpraş, will take place between 17 November and 4 December 2018. The 22nd Istanbul Theatre Festival will present a total of 52 performances by 24 theatre and dance ensembles – 12 from abroad and 12 from Turkey – in 21 different venues. The festival programme also features a number of events including panels, film screenings, master classes and workshops with the participation of international guests and experts. The programme of the 22nd Istanbul Theatre Festival was announced at a press conference held at Zorlu PSM Sky Lounge on the evening of 5 September. Hosted by Ceylan Saner, the night also saw the presentation of festival’s Honorary Awards. The event featured talks by İKSV Chairman Bülent Eczacıbaşı, General Manager of Aygaz Gökhan Tezel, General Manager of Opet Cüneyt Ağca and General Manager of Tüpraş İbrahim Yelmenoğlu from Koç Holding Energy Group Companies and Director of Istanbul Theatre Festival Leman Yılmaz. During the press conference and awards ceremony, gratitude plaques were also presented to each of the contributing organisations and institutions. The festival’s gratitude plaques were presented to the founding sponsor of İKSV Eczacıbaşı Group; official sponsors DHL, The Marmara Collection, and insurance sponsor Zurich Sigorta; Istituto Italiano di Cultura Istanbul, Institut Français Istanbul, Consulate General of the Kingdom of the Netherlands in Istanbul, ENKA Foundation, Türk Tuborg A.Ş., Credit Europe Bank N.V., Tekfen Holding, and Zorlu Performing Arts Centre for their support. The festival’s first Honorary Award was presented to the screenwriter, director, stage designer and academician Zeliha Berksoy. After graduating from the Theater Department in the Ankara State Conservatory, Berksoy worked as a directing assistant in 1967 at the Schiller Theatre, one of the Berlin State Theatres. She also worked as an assistant at the Berliner Ensemble Theatre. During her career of 42 years, she played a leading role in the major national and international plays, has attended many international theatre festivals and received various awards. The 22nd Istanbul Theatre Festival’s Honorary Award was presented to the artist by İKSV Chairman, Bülent Eczacıbaşı. The festival’s second Honorary Award will be presented to the Russian film and stage actor, and artistic director of the Theatre of Nations in Moscow Evgeny Mironov, following his performance in Hamlet | Collage, a contemporary adaptation of Shakespeare’s renowned tragedy by director Robert Lepage, on 22 November at Zorlu PSM Main Theatre. In the play, Mironov singlehandedly takes on the roles of 11 characters from Hamlet. The internationally acclaimed artist graduated from Saratov Theatre Academy in 1986, and from Moscow Art Theatre Academy (course master Oleg Tabakov) in 1990. Later he joined the company of Oleg Tabakov’s Studio Theatre, where he starred in a number of productions. Mironov starred in several legendary productions staged by leading European masters, such as Peter Stein’s Oresteia and Hamlet, Declan Donnellan’s Boris Godunov, and Eimuntas Nekrosius’ The Cherry Orchard. He is the co-founder of the Artists Support Foundation, the artistic director of the TERRITORIЯ International Theatre Festival and also Third Rome film studio, and a member of the Arts and Culture Council at the office of the President of the Russian Federation. The 22nd Istanbul Theatre Festival performances and side events will bring theatre lovers together in 21 different venues on European and Anatolian sides of Istanbul. Festival plays will be staged at the Venue Sponsor with the Highest Contribution Zorlu Performing Arts Centre (Main Theatre, Drama Stage, Studio, Sky Lounge), Moda Sahnesi, Salon İKSV, DasDas, Oyun Atölyesi, Yunus Emre Kültür Merkezi (Turhan Tuzcu Sahnesi, Müşfik Kenter Sahnesi), MSGSÜ Bomonti Yerleşkesi, UNIQ Hall, Üsküdar Tekel Sahnesi, and the venues that will host the festival for the first time this year: Duru Tiyatro, Toy İstanbul, Adahan Istanbul, and Abud Efendi Konağı. Festival’s free of charge side events will take place at Yapı Kredi Culture Centre, Goethe Institut and Zorlu PSM. The 22nd Istanbul Theatre Festival will be hosting 12 theatre and dance companies from around the world. As previously announced, the festival will be presenting Hamlet | Collage, staged by the Canadian director Robert Lepage featuring the famed Russian actor Evgeny Mironov playing 11 characters from Hamlet, as well as the dance marathon that consists of four distinct choreographies by Nederlands Dans Theater I, one of the world’s leading companies in contemporary dance. At last year’s festival, the audiences got the chance to enjoy Encore, the concluding play in the trilogy by Theodoros Terzopoulos, the greatest living master of Greek theatre. This year, theatre lovers will get the chance to see Amor and Alarme, the first two pieces in the trilogy. Additionally, Il Teatro Comico by Carlo Goldoni, one of the first names that spring to mind when it comes to the tradition of commedia dell arte, will hit the stage interpreted by Roberto Latini, who is known to bring classics to the stage with a contemporary view. PIXEL, choreographed by one of the iconic figures in the ‘90s hip-hop scene, Mourad Merzouki, will be pushing the boundaries of light and dance. On the other hand, Pss Pss by Compagnia Baccala, the product of a fruitful collaboration between Camilla Pessi and Simone Fassari, is a highly entertaining, smartly constructed, and quite unusual show that blends theatre with circus acts and the genre of clown. In collaboration with Platform 0090, an interdisciplinary and international workspace based in Belgium, the Istanbul Theatre Festival will present a selection of five productions that feature subjects, themes, and contexts related with Turkey and with the involvement of artists from Turkey. Presented under the title of “Choice from Flanders” and supported by the Flemish Ministry of Culture, the selection includes Fourfold by Meryem Bayram; Icelandic choreographer and dancer Bára Sigfúsdóttir and Iranian artists Masoumeh Jalalieh and Seyed Alireza Mirmohammadi’s collaborative work being; White on White conceived by Marc Vanrunxt for the modern dance artist and one of the most prolific names in the Western European dance scene Bahar Temiz; Nocturnal Symposium directed by Mesut Arslan who utilises a logic of installation while constructing the plays he directs; and YU, choreographed and performed by Gizem Aksu. The 22nd Istanbul Theatre Festival will feature 12 local productions. Talk About the Passion, the intense play by the British playwright Graham Farrow will be performed as a Duru Tiyatro production with direction from Emre Kınay. Contemporary dance artist and choreographer Tuğçe Tuna will be performing 45’s at Abud Efendi Mansion, which will serve as a performance venue at the festival for the first time. Haluk Bilginer, who has invested a tremendous amount of time and energy both as an actor and a translator to the works of Shakespeare, will be performing the titular character in King Lear in a Oyun Atölyesi production directed by Muharrem Özcan. Produced by Talimhane Tiyatrosu, Zebercet, the main character in Yusuf Atılgan’s cult novel Motherland Hotel, will be brought to life by Halil Babür in a one-man play adapted by Firuze Engin and directed by Kerem Ayan. Boğaziçi Performing Arts Ensemble (BGST) will bring a contemporary take on Franz Kafka’s Mr. K to the stage in the play Artık Bir Davan Var written by Cüneyt Yalaz and İlker Yasin Keskin; while DasDas will perform the topical British comedy writer Tom Basden’s Crocodile inspired by Dostoyevsky’s story of the same name. Written by Gülce Uğurlu through a collective production method, Guest will be performed under the direction of Ata Ünsal. The other companies that are on the roster of this year’s festival are: GalataPerform with their original production of House of Hundred about a mansion and its occupant, a woman who witnesses the history of Turkey from 1919 to the present; Bakırköy Municipality Theatres with Wolfram Lotz’s The Ridiculous Darkness directed by Nurkan Erpulat; Movement Workshop Company with Ruhiye; Taldans with Do Ku Man which was born ten years ago when the company transformed the workings of a textile factory in Linz to movement, sound, and rhythm; Istanbul State Theatres with His Master’s Voice that carries influences from all segments of one of Turkish literature’s most idiosyncratic voices, author Sevim Burak’s life and work, directed by İskender Altın. The festival programme also features more than 10 free of charge events including reader’s theatre, panels, film screenings, master classes and workshops with the participation of international guests and experts. The renowned Swedish choreographers Alexander Ekman, Pär Isberg, Pontus Lidberg, and Joakim Stephenson, with principal dancers from the Royal Swedish Ballet interpret Ingmar Bergman, who was a choreographer as well as being a stage and film director, through four unique dance performances reflecting on human relations and intense feelings in Ingmar Bergman Through the Choreographer’s Eye. Following the first screening of the film on 25 November, Joakim Stephenson will be available for a Q&A session. There will be two master classes as part of side events, first of which will be given by Theodoros Terzopoulos, the masterful living interpreter of Greek tragedies. Terzopoulos will be sharing with participants his acting methods which have inspired countless actors around the world. In the second master class, given by the world renowned Dutch contemporary dance company Nederlands Dans Theater 1, dance students will get the chance to work on some of the extensive repertoire of the company and improve their skills. As for the workshops, the PIXEL team will be giving a workshop in which participants will have the opportunity to learn various styles and techniques of hip-hop dance, and work on short choreographies. The following day, there will be another workshop, which will prove to be quite popular, where participants will get the chance to experience the digital aspect of the PIXEL’s choreography realised by Adrien M. / Claire B. by applying a few dance scenes under the guidance of a dancer and video director. Another workshop, Where is the Sight? moderated by Roberto Latini, the director of the play Il Teatro Comico, will focus on the theory and practice of stagecraft, while The Criticism Workshop, the first of which was held last year, will be moderated by author, critic, and journalist Christine Wahl. Özen Yula’s For Rent, which has never been staged in Turkey before, will be presented to theatre lovers moderated by Melis Tezkan and Okan Urun and feature subtitles in English. As usual, there will be an array of panels which theatre lovers will find to be quite satisfactory. The recipient of this year’s Honorary Award, renowned Russian actor Evgeny Mironov, who will also be seen in Hamlet I Collage bringing 11 characters to life from Shakespeare’s play, will be sharing his acting experiences. Professor at Gerasimov State Institute of Cinematography (VGIK), theatre critic, theatre expert and curator Kristina Matvienko will be talking about the different techniques of acting and directing in the Russian theatre in the 20th century, whereas professor at the Russian Academy of Theatre Art (GITIS), theatre critic and historian Alyona Karas will focus on how theatre directors’ ideas evolved and transformed in Russia in the first three decades of the 20th century. Lastly, the panel on The View of Contemporary Theatre moderated by Kadir Has University Department of Drama faculty member Özlem Hemiş will feature discussions on how the theatre stage is influenced by the new states of reality in which we live through an evaluation of the plays in the festival’s programme. The “International Platform” of the festival, which was organised for the first time in 2014, will continue in 2018 to ensure that successful examples of the local theatre stage are included in the programmes of various festivals and institutions abroad and reach a wider audience. The professional meeting and showcase programme will be on 29 November – 2 December within the scope of the festival. A number of theatre professionals from abroad will attend the showcase, get the chance to watch eight plays in the festival programme and meet the artists and communities of the festival plays. This year, the Istanbul Foundation for Culture and Arts (İKSV) added a new award to the array of awards it presents in various disciplines in order to support the development of culture and arts and the production of topical and quality works in Turkey. Realised with support from Gülriz Sururi, the Gülriz Sururi – Engin Cezzar Theatre Encouragement Award will be presented to theatre companies or individuals that contribute to the development of theatre in Turkey with their progressive approaches. The award will be in the summary of 100 thousand Turkish Liras and will be given to young thespians in order to finance their next projects. The recipient project will be included in the programme of the following Istanbul Theatre Festival. The selection committee, headed by Gülriz Sururi, includes actor, screenwriter, and entrepreneur Mert Fırat, actor and educator Tilbe Saran, translator, theatre critic, writer, stage and costume designer, journalist, and educator Seçkin Selvi, the director of the Istanbul Theatre Festival Leman Yılmaz, and actor Selçuk Yöntem. Recipient of the 2018 Gülriz Sururi – Engin Cezzar Theatre Encouragement Award will be announced in October. As well as the main festival sponsors – the Koç Holding Energy Group Companies Aygaz, Opet and Tüpraş – the 22nd Istanbul Theatre Festival is supported by Zorlu Performing Arts Centre, the Venue Sponsor with the Highest Contribution. The festival’s performance sponsors are the ENKA Foundation, Türk Tuborg A.Ş., Credit Europe Bank N.V., and Tekfen Holding. The festival acknowledges the kind collaboration of Istituto Italiano di Cultura Istanbul, Institut Français Istanbul, and Consulate General of the Kingdom of the Netherlands in Istanbul. 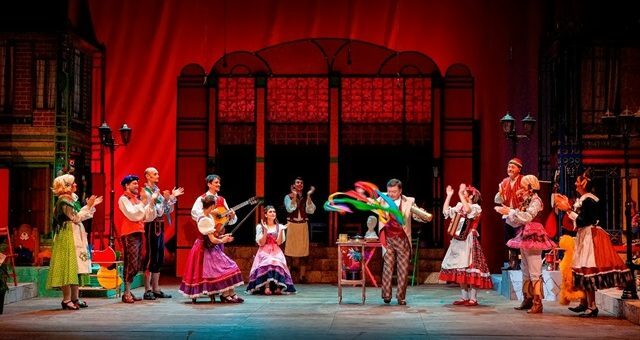 The 22nd Istanbul Theatre Festival is also supported by the Republic of Turkey Ministry of Culture and Tourism, Istanbul Metropolitan Municipality as well as Bakırköy, Beşiktaş, Beyoğlu and Kadıköy Municipalities. All festivals organised by İKSV are supported by the Leading Sponsor Eczacıbaşı Holding, Official Carrier DHL, Official Hotel Sponsor The Marmara Collection, and Insurance Sponsor Zurich Insurance Group. The publicity campaign for the 22nd Istanbul Theatre Festival was developed by TBWA / İstanbul. On the day of the performance, tickets purchased through Biletix Customer Service, Biletix app and Biletix web site, can be collected from the event venue, two hours before the performance. Tulip Card holders receive special discounts of up to 25% on festival tickets. White and Black Tulip members can purchase advance tickets on 10 and 11 September, Red and Yellow Tulip members can purchase advance tickets on 12, 13 and 14 September. As part of İKSV’s target of increasing and facilitating easier access for students to culture and the arts, student tickets for all plays will be on sale at 10 TL with the support of Aygaz, Opet and Tüpraş.